I simply don’t understand; it was meant to be dead on arrival. The Fox comedy Keeping Up with the Joneses, with its sitcom plot and worrying lack of actual jokes, was tossed around from one release date to another by the studio (SURELY a sign of its incredibleness), had a severe lack of advertising which gave people even more fears, and not only recently debuted to a poor 17% on Rotten Tomatoes but also, if early box office numbers are to be believed (this review was written on the Sunday morning before the actual numbers came in), it’s a huge, huge flop. So, with everything in its path making it destined to fail spectacularly, why was I disappointed that I wasn’t more disappointed? I genuinely went into this thinking I was going to be getting the next Unfinished Business, from sheer mathematical deduction based on the negative hype and horrendous advertising. But to my surprise, I came out not hating it like I thought I would, but also not praising it to the highest heavens either like I knew I wouldn’t. It is a completely middle-of-the-road movie, more so than it probably has any right to be, and I think I have a couple of theories as to why that is. Before that, a little more detail on that sitcom plot I mentioned earlier: a suburban couple (Zach Galifianakis and Isla Fisher), mostly bored at home and at their mundane day jobs, become fascinated with their new neighbours the Joneses (Jon Hamm and Gal Gadot), who seem to be the perfect couple, maybe a little too perfect, which slowly raises their suspicions that they’re hiding something. Turns out they’re right, as the “Joneses” are actually undercover spies who are investigating a possible case of espionage at the government corporation that Galifianakis’ character works at, and naturally he and Fisher soon get caught in the crossfire. Of course, it’s as basic a plot as you can get, one that might not even make it past the pilot stage for a new television show, and the script contains as little actual jokes as it can to actually resemble a failed pilot for a new comedy series. Throughout at least the first half, the laughs are either very few in between or completely non-existent, and the ones they do try to work in mostly fall flat. It picks up a little bit in the second half, but even then it doesn’t become a full-on laugh riot like it thinks it should be. But here’s the thing, for me at least: as laugh-free as the script may be, I could tell almost instantly that everyone, from the cast to director Greg Mottola (previously of Superbad fame), was still giving their all in this. There is clear effort that was thrown into the making of this film, probably where it doesn’t deserve to be thrown, but it actually helps the film become more charming and even more likable than the script would otherwise allow. Sure, you’ve got these talented actors saying some really unfunny stuff when you analyse it, but the way in which they’re delivering them actually did raise a smile on my face, despite myself. Sure, Mottola is stuck calling the shots on a very standard spy caper with not very well written comedic elements thrown in there for good measure, but when the time comes to deliver an action set-piece – mostly in the second half – he actually makes it fun to watch, and not a slog like so many humourless comedies I’ve seen as of late. Both the cast and director also combine their abilities to actually try with this material, and even make time to make their characters quite charming with some good chemistry and solid rapport between them. 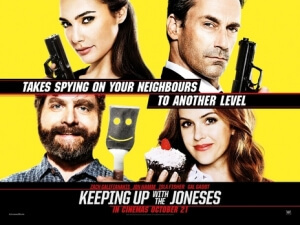 While I cannot say at all that Keeping Up with the Joneses is necessarily a good movie, it surprised me that there was enough talent involved in this to keep it afloat as much as it deserved to. Galifianakis, Fisher, Hamm et al are all fine comedic actors who are genuinely trying to make lifeless material such as this actually work, and Mottola has made enough comedy movies in the past to show that he can make a competent movie regardless of what he’s been hired to work with, so if anything they deserve a hell of a lot of credit for turning what could have been a completely joyless waste of time into something that still isn’t good, but enjoyable enough for me to say I’m glad I saw it at least once. Keeping Up with the Joneses may have enough for it to fully fail, including a stale sitcom plot and a largely unfunny script, but it’s elevated to something more watchable by the clear effort thrown in by its talented comedic cast and director, whose combined efforts make it more charming than it has any right to be.